Home / #American_Road_Radio / #AmericanRoadRadio / #HumanRights / #TrueNews / #Women #Health / Anxiety / Health / #Women's #Health Alert : Anxiety Disorders , how to recognize them, how to treat them. #Women's #Health Alert : Anxiety Disorders , how to recognize them, how to treat them. Anxiety is a normal response to stress, but if it becomes overwhelming and difficult to conduct your daily routine, it may be time to seek help. It's natural to worry during stressful times. But some people feel tense and anxious day after day, even with little to worry about. When this lasts for 6 months or longer, it may be generalized anxiety disorder. Many people don't know they have it. So they may miss out on treatments that lead to a better, happier life. The main symptom is a constant and exaggerated sense of tension and anxiety. You may not be able to pinpoint a reason why you feel tense. Or you may worry too much about ordinary things, such as bills, relationships, or your health. It can upset your sleep and cloud your thinking. You may also feel irritable due to poor sleep or the anxiety itself. Your troubles will naturally concern you. What sets generalized anxiety disorder apart is the feeling that you can't stop worrying. You may find it very hard to relax, even when you do something you enjoy. Severe cases can hamper work, relationships, and daily activities. People of any age can develop generalized anxiety disorder, even children. It tends to appear gradually, with the first symptoms most likely to happen between childhood and middle age. Twice as many women as men say they have it. The genes passed down through a family may put some people at a higher risk for anxiety, but that's not the whole picture. Your background and experiences also matter. Brain chemicals called neurotransmitters, as well as a pair of structures inside the brain called the amygdalae, seem to be involved. There's no lab test, so the diagnosis is based on your description of your symptoms. Your doctor may ask, What do you worry about? How often? Does your anxiety interfere with any activities? 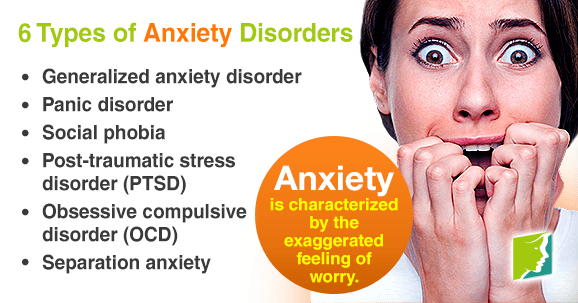 It may be generalized anxiety disorder if you have felt anxious or worried too much for at least 6 months. One kind of talk therapy is very effective in treating anxiety. It's called cognitive behavioral therapy. A counselor helps you identify your negative thoughts and actions. You may do homework, such as writing down the thoughts that lead to excess worry. You will also learn how to calm yourself. Medicines may be part of your treatment plan. Some newer antidepressant drugs work well to lower anxiety. It may take about 4 weeks to feel better. Your doctor might prescribe a benzodiazepine during this time or for a short while. Some of these drugs carry a risk of dependence. Sometimes, older types of antidepressants can treat generalized anxiety disorder if your symptoms include depression or panic. Talk with your doctor about pros and cons. A few simple changes can help. Avoid caffeine, illegal drugs, and even some cold medicines, which can boost anxiety symptoms. Try to get enough rest and eat healthy foods. Use relaxation techniques, such as meditation. Also, exercise! Research shows that moderate physical activity (like a brisk walk) can be calming. If you are thinking about trying a supplement, talk to your doctor first to find out if it’s safe. Kava, for instance, has been reported to cause liver damage. St. John’s wort can affect other medicines, including antidepressants and birth control pills. People who have generalized anxiety disorder may also develop depression, alcoholism, or drug addiction. It's also common for people with GAD to have another anxiety disorder. These can include panic disorder, posttraumatic stress disorder, obsessive-compulsive disorder, and social phobia. People with panic disorder have sudden attacks of terror. Symptoms can include a pounding heart, sweating, dizziness, nausea, or chest pain. You may think you're having a heart attack, dying, or losing your mind. It's one of the most treatable of all anxiety disorders. Some people develop posttraumatic stress disorder (PTSD) after living through a terrifying event. The symptoms include vivid flashbacks and a loss of interest in activities that were once enjoyable. People may also have trouble being affectionate. They may feel irritable or even become violent. Treatments include medicine and counseling. People with obsessive-compulsive disorder (OCD) have troubling thoughts they can't control. They may feel that they need to repeat rituals, such as washing their hands or checking that the door is locked. They may get dressed in a certain order or count objects for no good reason. It’s often treated with medication and psychotherapy. People with social phobia feel panicky and self-conscious in ordinary social situations. Symptoms include a sense of dread before social events and sweating, blushing, nausea, or trouble talking during the events. In severe cases, they may avoid school or work. It can be treated with psychotherapy and medicine. A phobia is an intense fear of something that is not likely to cause you any harm. Common ones include heights, closed-in spaces like elevators, dogs, flying, and water. Many people don't seek help because it’s easy to avoid whatever they fear. But phobias can be treated. Start by talking with your family doctor. If an anxiety disorder seems likely, he will probably refer you to a mental health specialist who is trained in psychotherapy. It's important to choose someone you're comfortable talking to.